The magician's job is to create a mystery--an unbridgeable gap between cause and effect. 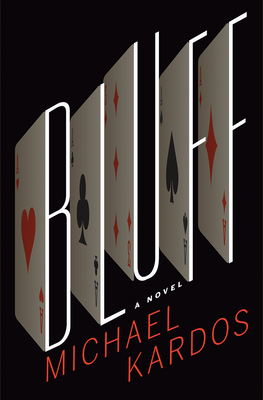 Michael Kardos brilliantly constructs his new novel Bluff as a magician would, delivering a perfectly calibrated performance of intrigue and, ultimately, astonishment. At twenty-seven, magician Natalie Webb is already a has-been. A card-trick prodigy, she started touring at seventeen, took first place at the World of Magic competition at eighteen, and never reached such heights again. Shunned by the magic world after a disastrous liaison with an older magician, she now lives alone with her pigeons and a pile of overdue bills in a New Jersey apartment. In a desperate ploy to make extra cash, she follows up on an old offer to write a feature magazine article--on the art of cheating at cards. But when she meets the perfect subject for her article, what begins as a journalistic gamble brings into question everything Natalie thinks she knows about her talent, and herself. Natalie is dazzled by the poker cheat's sleight of hand and soon finds herself facing a proposition that could radically alter her fortune--to help pull off a $1.5 million magic trick that, if done successfully, no one will ever even suspect happened. With Kardos raising the stakes chapter after chapter, Bluff is a breathtaking work of suspense from a writer at the top of his game. Michael Kardos is the Pushcart Prize-winning author of the novels The Three-Day Affair and Before He Finds Her and the story collection One Last Good Time. Originally from the Jersey Shore, he lives in Starkville, Mississippi, where he codirects the creative writing program at Mississippi State University.